What are JOBS H2 and JOBS NG? Developed for the U.S. Department of Energy‘s Energy Efficiency and Renewable Energy (EERE) Office by Argonne National Laboratory and RCF Economic and Financial Consulting, Inc., JOBS and economic impacts of Hydrogen (JOBS H2) and JOBS and economic impacts of Natural Gas (JOBS NG) are spreadsheet models that allow users to estimate economic impacts from the development and operation of select types of hydrogen and natural gas fueling stations. Within EERE, JOBS H2 was supported by the Fuel Cell Technologies Office; JOBS NG was supported by the Clean Cities Program within the Vehicle Technologies Office. JOBS H2 and JOBS NG use input-output methodology to estimate changes in industry expenditures, and then calculate the ripple effects of those changes throughout the economy for a user-selected geographic region of interest. As shown in the following illustration, multiple supply chains are required to develop and operate fueling stations. Equipment must be produced, procured from vendors, shipped and installed. The station itself must be designed, permitted, built and commissioned. And once the station is complete, equipment must be maintained, fuel must be produced and delivered, and other operating expenses must be paid. As these dollars flow through the economy they provide jobs and income to individuals and establishments directly involved in developing and operating stations (direct jobs), to individuals and establishments further up the supply chain (indirect jobs), and to an array of service and support industries whose growth is induced by the re-spending of those dollars in the economy (induced jobs). 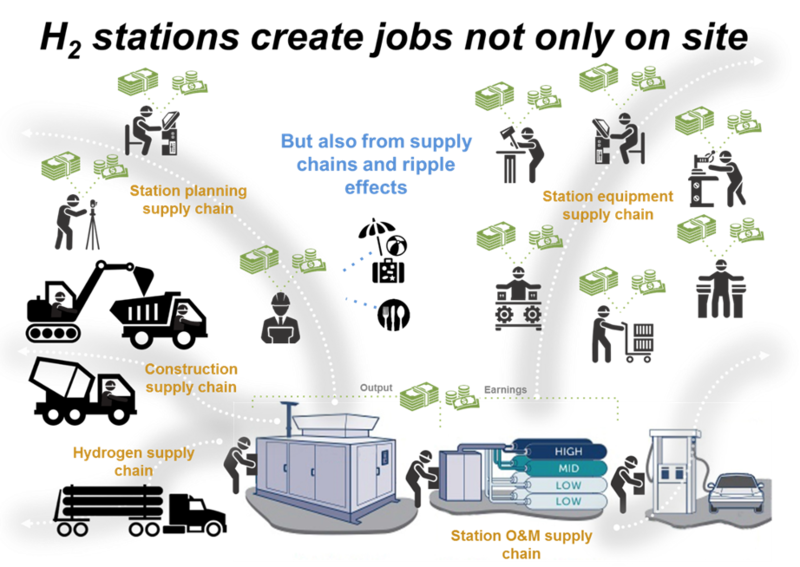 While the above figure illustrates supply chains for hydrogen stations, natural gas station supply chains are similar. The most notable difference between them lies in how fuel is delivered to the station. For hydrogen stations fuel is supplied by truck in liquid or gaseous form. For CNG stations fuel is supplied via pipeline from local distribution companies. What geographic region should be examined (i.e., the US as a whole, any one of the 50 states or any one of the nine census regions)? How many stations to begin developing in each year of the scenario? What size stations (in terms of kg/d capacity for hydrogen and either scfm or gge/day for natural gas) should be examined? For hydrogen stations, how long (one or two years) will station development take? And what will station utilization rate (kg H2 dispensed/kg capacity) be? "Local Shares", is an important feature of the tools since impacts are estimated only from expenditures that occur within the selected geographic region. Thus, users must specify the proportion of expenditures which occur within the region for several parameters (including manufacturing and wholesaling equipment, shipping, site prep, fuel production, etc.). Users may also specify a broader geographic unit of analysis (e.g., national instead of state) to internalize out-of-region purchases. A complete list of parameters for which local shares may be specified is contained in the User Guide sheets of JOBS H2 and JOBS NG. All JOBS models must be run in Microsoft Excel 2010® for full functionality. The model is available as an open-source software package copyright by UChicago Argonne, LLC. Prior to downloading the model, users must register.